This patient came in today with a necrotic tooth #14. She had a draining sinus tract on the palatal and recounted a history of massive palatal swelling. Diagnostic tests found #14 Necrotic Pulp with Chronic Apical Abscess. The tooth had a MO amalgam & O amalgam. Patient also has a history of bruxism with cuspal fractures on other teeth. 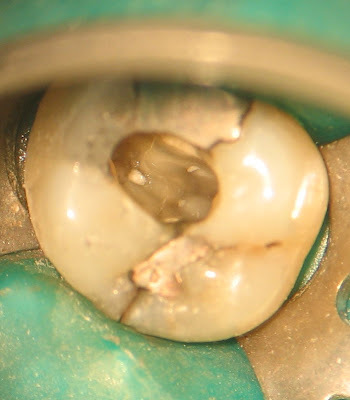 Upon access, a crack running down the distal wall and a crack running down the mesial wall both took a left turn and met across the pulpal floor. This tooth was then diagnosed as non-restorable and an extraction was recommended. Had this tooth been crowned previously, it may have been saved. When patients exhibit severe patterns of occlusion with bruxism, I would recommend cuspal coverage at an earlier stage. If you have difficulty making this recommendation to your patients, I would be glad to send you some pictures from my photographic collection called, "Teeth that might not have fractured if they had been crowned". You could make a nice picture book with these photos.